The Haskell Indigenous Foods Festival seeks to restore balance in our relationship with the earth and our communities by increasing awareness of food, environment and health. By honoring the traditional teachings of our Indigenous relatives we restore respect for the blessings of food, soil, water, and air that we must have to ensure a healthy life for the next seven generations. Communities around the world are working to restore healthy, local, and culturally relevant food systems. As the first “local food” purveyors of North America, Indigenous communities have practiced and retained diverse and varied food traditions for countless generations. Some traditions don’t look exactly the same as they did 200 years ago due to a variety of social and political barriers, but the ongoing evolution and vibrance of Indigenous food traditions are a living example of the resilience and innovation of our communities. We hope you can join us at the Haskell Indigenous Food Festival to celebrate the work started by our relatives generations ago that continues today throughout Indian Country! Casey Camp-Horinek is from the Ponca Nation of Oklahoma and is a long-time Native rights activist, environmentalist, and actress. As traditional Drumkeeper for the Ponca Pa-tha-ta, Woman’s Scalp Dance Society, Camp-Horinek helps maintain the cultural identity of the Ponca Nation of Oklahoma for herself, her family, and her community. She has been at the forefront of grassroots community efforts to educate and empower both Native and non-Native community members on environmental and civil rights issues. In April of 2008 Camp-Horinek, as a delegate of the Indigenous Environmental Network (IEN), was chosen to speak to the United Nations Permanent Forum on Indigenous Issues and present IEN’s global platform regarding the environment and Native rights. 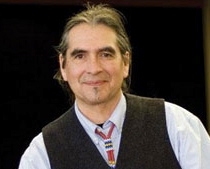 Dr. Daniel Wildcat, Ph.D., is a professor at Haskell Indian Nations University in Lawrence, Kansas, and an accomplished scholar who writes on Indigenous knowledge, technology, environment, and education. He is also co-director of the Haskell Environmental Research Studies Center, which he founded with colleagues from the Center for Hazardous Substance Research at Kansas State University. A Yuchi member of the Muscogee Nation of Oklahoma, Dr. Wildcat is the coauthor, with Vine Deloria, Jr., of Power and Place: Indian Education in America (Fulcrum, 2001). His most recent book is Red Alert! Saving the Planet with Indigenous Knowledge (Fulcrum, 2009). Known for his commitment to environmental defense and cultural diversity, Dr. Wildcat has been honored by the Kansas City organization The Future Is Now with the Heart Peace Award. Danon Hare, a native of Pawnee, Oklahoma, joined Americorps in 2009 to serve on the San Felipe Pueblo Reservation. Data he helped collect through the Johns Hopkins Center for American Indian Health revealed an urgent need for Diabetes prevention education for the youth in the community. His second term of service brought him to Harvesters Community Food Network in Kansas City to work as a Volunteer Coordinator with the largest BackSnack Program in the nation; a supplemental food program for children on the free and reduced lunch plan. He is currently an employee at Harvesters. David is Hopi and Pima from the village of Bacavi on the Hopi Reservation in northeastern Arizona. His immediate family has been farming in their area for at least four generations. Before them, ancestral people farmed their land intermittently for nearly a thousand years. His family farms in a largely traditional manner, using little farm machinery and employing ancient dry land farming practices that allow them to grow corn in an arid environment that receives only 8-12 inches of rain per year. He is a former kitchen manager at Hotevilla Bacavi Day School, recently studied at the UC Santa Cruz Center for Agroecology and Sustainable Food Systems and is currently a FoodCorps member at Eagles Nest Intermediate School on the Navajo Nation. Eddie Joe Mitchell, tribal citizen of the Prairie Band Potawatomi Nation, is a traditional gardener and project coordinator for the "Return to a Healthy Past," Diabetes Prevention Program housed at the Prairie Band Potawatomi Health Center near Mayetta, Kansas. Heidi completed a Bachelor’s degree in Ecology and Evolutionary Biology, and a Master’s degree in Global Indigenous Nations Studies at the University of Kansas. Ms. Mehl's Master’s thesis, “Water Quality Issues Facing Indigenous People in North America and Siberia,” examined ways to situate scientific information within Indigenous worldviews to help communities become informed decision makers about the quality of their water resources. She has worked as the USGS hydrologist overseeing water testing on the Potawatomie Reservation in northeastern Kansas, and conducted several grant funded projects in the Altai Republic in Siberia, co-developing databases and creating outreach programs with stakeholders in each community to address concerns about their water resources and the problems they are facing. In both communities, she performed water quality tests of local rivers, lakes and streams using both community participatory methods and state-of-the-art scientific methodology. Heidi was recently awarded a prestigious fellowship to study the quality of Prairie Band Potawatomi Nation's streams. Mr. Mason is the Food Service / Farm Administrator at a federal correctional institution (USP Leavenworth) in Leavenworth, Kansas. A two-time war veteran, college graduate, community activist and Community Leader, he started the Leavenworth prison’s Therapy and Mentor Horticulture program in 2008. He provides inmates assigned to food service the opportunity to acquire skills and abilities that may assist in obtaining gainful employment after release. Joe Mason oversees all Food/Farm Programs that consists of several specialized programs including Satellite Feeding program, Medical Diets program, Religious Diets program, Culinary Arts program, Composting program, vermiculture program, Food Safety program, Water shed Program, Greenhouse and Horticulture Program, Water Harvesting program, and is responsible for feeding 2300 inmates three times every day. Through Mr. Mason's leadership the integration of these programs at the Leavenworth prison farm serves as a model of ecological responsibility. Additionally, Mr. Mason believes that given the right skills, purpose, and education recidivism rates could dramatically decrease. As the state climatologist, Mary Knapp occupies a unique position in the Department of Agronomy. She is responsible for establishing and maintaining a statewide network of equipment for gathering of weather data and answering questions on climate and weather matters. 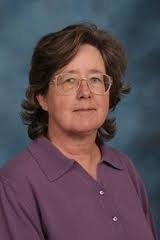 She also maintains the website that provides a constant update and complete archive of weather-related data for Kansas. Her degree is in Agronomy from K-State but her career path started after a stint in the Peace Corps in the Dominican Republic as a rice specialist. After a number of years as a research assistant in Entomology, she joined Computer Information Systems at K-State Extension, working with the State Climatologist Dean Bark. When Dr. Bark retired she became the acting State Climatologist and has held the position ever since. Ruth Anna Buffalo, carries her late grandmother Ruth’s Hidatsa (Nuxbaaga) name, Mia E’desh, (Women Appears) and is a member of the Awa xia clan (Dripping Earth) from the tribal community of Mandaree, ND located on the Fort Berthold Indian Reservation. Ruth served 7 years at United Tribes Technical College as the Director of the Strengthening Lifestyles’ comprehensive wellness program which serves elementary students, college students, employees, and their families. Most recently she served her tribe in the capacity of Summer Youth Work program coordinator in which she oversaw 120 youth and 12 district coordinators. She has also taught CPR/1st Aid classes as well as Fitness, Wellness classes, co-facilitated weekly Fitness/Nutrition group sessions for the students and employees and coached basketball. Ruth carries certifications in Worksite Wellness, Cooper Fitness specialist, Tai Chi Easy group facilitation and has obtained a Master’s in Business Administration and a Bachelors of Science in Criminal Justice from Si Tanka University, Huron, SD. Ruth is a 2011 Alumni of the Tri College National Education’s Womens Leadership Development Institute. She is currently a Susan G. Komen for the Cure Scholar in the Master of Public Health (MPH) program at the University of Kansas Medical Center and works as a Graduate Research Assistant with Center for American Indian Community Health, where her work focuses on breast cancer research for both men and women. She enjoys spending time with her family, gardening, running, playing basketball and learning her tribal language while maintaining her tribal cultural way of life. Sasteh Mosley is a farm, food, and community activist and is Get Growing KC team member with Cultivate KC. 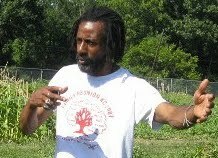 His most recent work focuses on increasing the number of urban farms and gardens on the east side of Kansas City through East Meets West of Troost and Green Acres. He runs The Mosley Farm, an energy efficient home located on the Smart Grid, focused on training youth for employment in the green industry. He also has a strong background in electrical engineering specializing in conservation engineering, wireless networking and, in the past, military and nuclear power plant engineering. Throughout his life he has actively promoted strong cultural and community connections through educational projects, political action, and the arts, strongly focused on at-risk, low-income youth living on the Eastside of KCMO. Through his prior experiences working with Milwaukee, WI-based organization Growing Power, Sasteh has developed a solid foundation for making the connections between growing food, community development, and neighborhood empowerment. All content © 2011 by Brett Ramey.